5. Red Jacket Park? | There once was a creek . . .
Of the many people who use or live near Gregory Park today, I suspect that few have ever heard of Red Jacket Swamp. 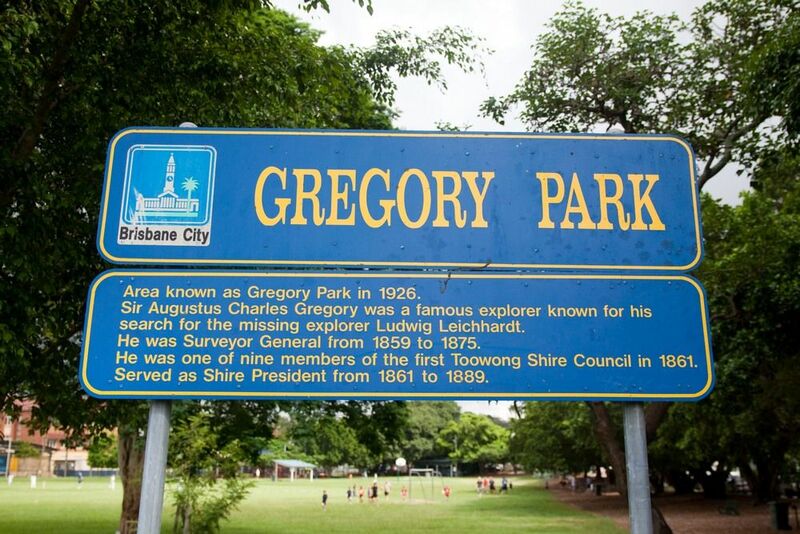 Probably, few of them have heard of A. C. Gregory either, but if they care to look they will find not only the prominent sign listing Gregory’s credentials as an explorer, Surveyor General and Shire President, but also the sundial erected in his honour in 1976 by the Queensland Division of the Australian Institute of Surveyors. But there are no such signs or monuments to tell us about Red Jacket Swamp; nor has this colourful title lived on in the names of nearby streets or localities. The swamp and its name have been banished from maps and memories alike. Of course, this state of affairs is hardly accidental. The last thing that Rosalie residents in the early 20th Century would have wanted was a street name or road sign to remind them of the quagmire that plagued their neighbourhood for so long. Stepping into their shoes, we can see why they chose not to call the place ‘Red Jacket Park’. That name, appealing as it may sound, would have brought with it too many bad memories. Red Jacket Swamp was something that they would rather have forgotten. But in forgetting Red Jacket Swamp, we also forget about what those early residents endured, and what they ultimately achieved, so that Rosalie might have its village green. We can enjoy Gregory Park without knowing its history, but only at the expense of taking for granted the efforts of several generations of residents, councillors, engineers and labourers that have made the park what it is today. Just as importantly though, by forgetting Red Jacket Swamp we also lose touch with the site’s natural history. We forget that our streets parks and houses were built on a landscape that pulsed with its own rhythm of life for thousands of years before it was settled by Europeans. We forget too that this landscape was home to countless generations of Aboriginal people, who no doubt would have given Red Jacket Swamp a name and imbued it with legends long before white people came and made up their own. Perhaps it is time to welcome Red Jacket Swamp back into the neighbourhood from which it was banished. After all, the residents of today can do this without the unpleasant memories held by earlier generations.[1. If there are people still around who can remember Red Jacket Swamp, I’d love to hear from them!] I don’t expect to see a monument to Red Jacket Swamp unveiled alongside A. C. Gregory’s sundial anytime soon. (A more likely place to see one would be the redeveloped Frew Park.) But if we honour A. C. Gregory as the father of the park, ought we not also acknowledge Red Jacket Swamp as its mother? Next time you walk across Gregory Park, or run across it, or play or sit on it, think a bit about what is beneath your feet, and how it came to be there. Beneath that thin veneer of grass and topsoil there are several feet of ash and rubbish dumped to raise the park in the 1930s. Going deeper still, there is soil excavated from Howard and Thomas streets before the turn of the century. Or if you are standing above the drain running across the front of the school, there is a good chance that the Brisbane River is lapping beneath you, mixing, as it has always done, with the stormwaters from Rainworth, Paddington and Rosalie. And at the bottom of it all lurks the ghost of a notorious swamp, once a hotpot of life, later a hotbed of disease, and now little more than a legend. Embedded in these layers of local history is the story of how Red Jacket Swamp became Rosalie’s playground. An excellent account of the development of our inner-city suburbs and the progress made in health by improvements to storm water drainage.